I conceived of, organized and co-facilitatedThe Brooklyn Commune Project, a grassroots initiative of Culturebot.org and The Invisible Dog Art Center, to educate, activate and unify performing artists of all disciplines to work together towards a more equitable, just and sustainable arts ecology. It was structured as an iterative, collaborative public research & visioning process investigating the economics of cultural production in the performing arts. 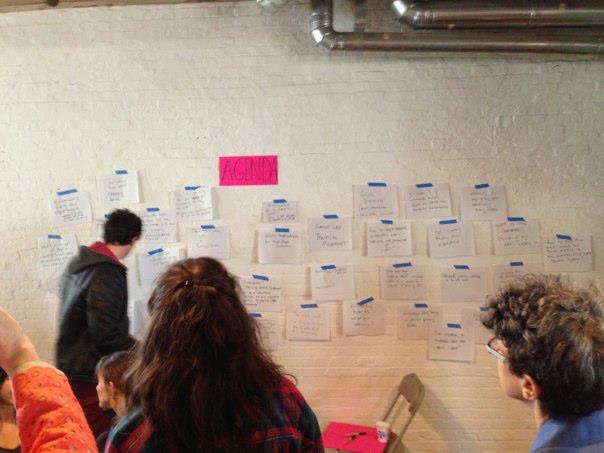 The project’s goal was to create an artist-driven vision of a healthy arts ecosystem in America and to bring artists, institutions, administrators and funders together for mutually respectful, open, non-hierarchical discourse around difficult topics such as resource allocation, capital, value, labor, aesthetics, diversity, equity, inclusion and quality of life. The BKCP published a report, “The View From Here“, which was presented at APAP 2014 accompanied by a series of public programs. It is a comprehensive 52 page document examining the current state of the performing arts in the United States, how we got here and possible futures – all from the perspective of artists. The document was collaboratively created through the research, investigation and writing of a core group of artists and artist/administrators and was presented at the Association of Performing Arts Presenters conference in 2014. It has been and continues to be widely read by artists and artist/administrators in the U.S. and around the world.